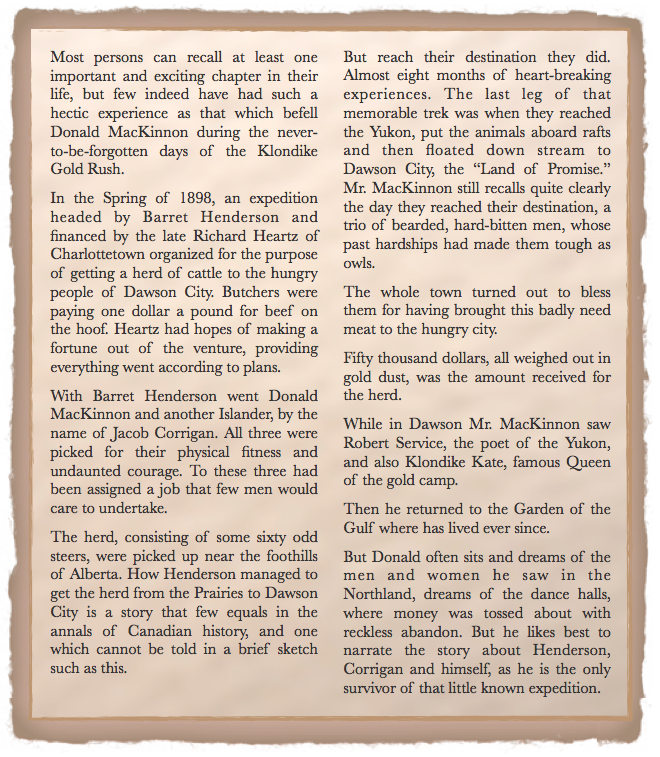 Frank Gillespie’s story of adventure during the Klondike Gold Rush has me temporarily hooked on adventure stories from those days. I found a news clipping in My Mother’s Scrapbook about another Island chap, Donald MacKinnon written by Frank MacArthur in The Guardian, 1943. Mr. MacKinnon was 90 years old at the time of the interview and lived in North River. In a later clipping announcing Mr. MacKinnon’s passing at 96 years old, F.H. MacArthur writes that this expedition was the first and only one of its kind. To read other poems of Robert Service, click here. For more information on Klondike Kate, click here.